The nature of my work varies from medium to medium, yet it always comes from the breath of my soul, my intuition, my quiet place, my heart. My joy and my hope is to spread love into the universe by incorporating love into everything that I create. For me, Art is Prayer. Vikki is a painter who work predominantly in mixed media, acrylics, and oils, but paints furniture and does some 3D pieces as well.. Her style is recognized for her distinctive use of color, intuitive hidden messages, and for the infusion of love into each of her pieces. Weigel has received many awards and ribbons for her work, she has secured several licenses ( such as with Home Goods, and Haverty’s), and her work is sold and collected around the world. She owns and operates an art studio, Vikki Paints/Kunst Haus Studio, in Tyrone, GA, where she hosts art parties, teaches workshops, and holds camps. 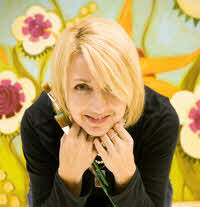 Vikki Mancil Weigel, a self taught artist, is a spontaneous painter who draws from her intuitive. She is recognized for her brilliant color palette and charming childlike spirit. Vikki’s subjects include very personal childhood memories, whimsical “fantasy” characters, quirky animals and wildly patterned florals. A lot of her work speaks to the sisterhood of women and to the innocence of children (inspired by childhood and her 5 year old daughter Versailles). Additionally, she paints whimsical portraits of kids, friends, families, and pets, as well as custom decorative work such as murals, wall finishes, and painted furniture. At first glance her works might say “happy,” fun,” “whimsical” – but with a closer look the word “soulful” comes to mind. Vikki’s work is collected and sold throughout the US as well as in Canada, Germany and Japan. She was the first commissioned Featured Artist for the Stone Mountain Yellow Daisy Festival (the #1 Arts and Crafts show in the US) in 2002. For that image she won two awards, the Georgia Festival and Events Association’s pick for best t-shirt design and best poster design for 2002. Vikki has been honored as featured artist several more times and has designed several more posters for Yellow Daisy since 2002. In 2008 she entered into a partnership with Paragon Picture Gallery and launched a national children’s line of art that has continually made their top sellers lists. Currently, Vikki’s original designs are being created into fabrics to be launched in the marketplace summer 2010. Although Vikki has been a full time painter for 15 years, she has held several other professional positions in the art world. She was the Assistant Director for both the Columbus Museum Uptown (Columbus, GA) and the Kentuck Museum (Northport, AL), the Folklife Village Cultural Arts Coordinator for 8 years (Riverfest, Columbus, GA), and the Owner and Operator of the Out of Hand Center for Creative Arts. She has taught many workshops at museums, art centers, schools, and private parties. She was a resident painter for the Sugarhill Catalog producing hand painted decorative items for the catalog to sell throughout the US and Japan. Vikki holds a Bachelor of Arts degree in Communications and Information Sciences from the University of Alabama.